A photographic portrait is a work of art. There is nothing automatic or accidental about it. Cameras don’t automatically produce portraits just because they’re pointed at someone when the shutter is tripped. But if that’s true, what amount of artistic intent and skill is required? ?Did you invest that in your latest cell phone selfie? What about a picture of your family in front of the Christmas tree moments before they assault the gift pile? How about that series of hastily posed little league photos from t-ball to minors to majors, bat on shoulder, year after year? A definition that includes shapshots like those seems far too broad to me. The great portrait photographer, Yousuf Karsh, photographed Muhammad Ali in 1970. He lamented that there was never any real connection, as Ali talked about superficial matters. Ali chose his pinstriped suit, he said, to command the respect he deserved. The result of the session was not a portrait, but Ali's self-caricature. In the days when only the wealthy and powerful sat for portraits, artists frequently surrounded their subjects with iconic “props” to give the sense of who the person was. That’s an approach photographic portrait artists still use, today. Here’s a famous example by Yousuf Karsh, perhaps the greatest portrait photographer of the 20th Century. In this image, the subject leans on a concrete railing or wall, while soft daylight filters through the triangular framework of a skylight. Nearby are articles recalling classical, or pre-classical art. The subject is elderly, immaculately dressed, and distinguished. Unless you’re a fan of Karsh, or an architect, or an art historian, you may not recognize Frank Lloyd Wright, one of the most imminent architects of the last century. The overhead skylight recalls the geodesic dome, Wright’s most famous invention. The dark and heavy architectural elements combined with Wright’s formal attire and his unsmiling gaze reflects his element, his gravity, and his importance. Wright was an ideal subject for this sort of “environmental” portrait. It was fairly easy to surround so accomplished a person with meaningful symbols. (Turning that collection of symbols into a greatportrait is another matter!) Unfortunately, this technique is often used to create a lot of “low hanging fruit” for portrait shooters, who do things like pose high school seniors in letter jackets, holding footballs, and standing in front of shiny cars. The risk of using such props is that you can reduce the subject to a cliché and say nothing about the individual. Karsh’s near infallible artistic judgment will not let that happen in a portrait of someone like Wright, but can you avoid it in a portrait of someone who is not well-known? I believe so. learned anything about this young man other than what this photo has to say, you should still come away with the impression of a serious musician, a characteristic that, at his young age, dominates his personality. It’s more difficult to evoke that sense of the real person without the use of external storytelling props. The results, because such photos rely only on capturing the subject at a meaningful moment, can be very powerful. One of my favorite examples, again from Karsh, is this simple portrait of a very famous person. Because his fame was at its peak in the mid-20th Century, you may not recognize him immediately. Even so, you should get an impression of this person’s character. The heavy turtleneck sweater, the beard, and the weathered complexion are reminiscent of a mariner. That, as it turns out, is a deceptive irony. The impression of a burly toughness is genuine, however. But that toughness is contradicted by the gaze, which is distant, soft, and perhaps worried. Toughness and sadness in the same face. Seemingly invincible, perhaps. Four years after this pensive portrait, the troubled writer took his own life. The portrait not only succeeded in creating the sense of what it was like to be near Hemingway, but was also prophetic. The key to succeeding at this type of portrait is recognizing the moment when it happens. 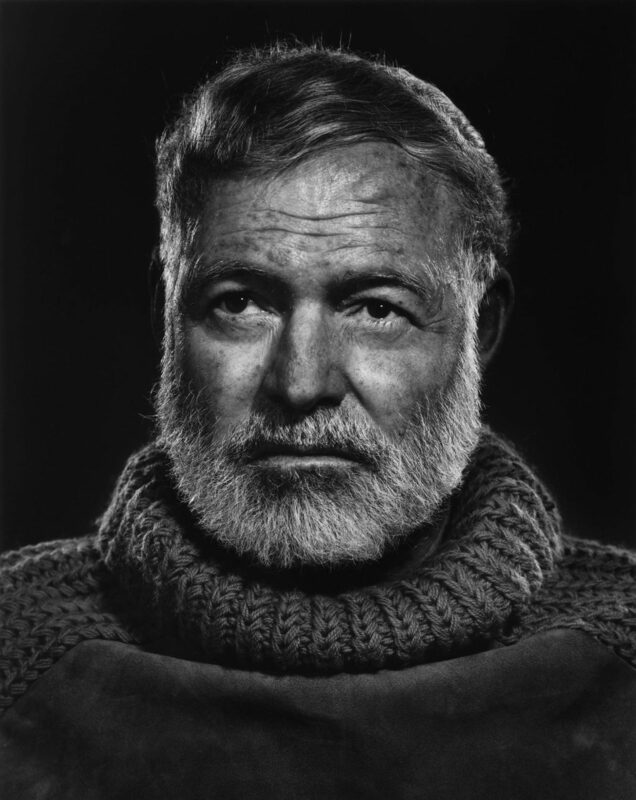 With Hemingway, the public persona was contrary to the image Karsh captured. Had Karsh been intent on capturing an image of a fearless outdoorsman and war correspondent, he might have missed this shot. Everyone has multiple facets to their personality. Those a person shows least often may be the most telling. I have seen similar events many times during portrait sessions, but they only occur (or I’m only able to recognize them) when the session lasts long enough to establish some rapport with my subject. clothing changes, lasted about 3 hours. That’s usually long enough for a friendly, unselfconscious person to relax and feel confident in the process. And it was this time. Towards the end of a session filled with images of her smiling brightly or looking intensely at the camera, I asked her to turn away from me slightly and hold her pose while I changed the lights slightly. Then, as I feigned making camera adjustments, I watched her expressions, to see if she might, for a moment, lose focus on me and drift into her own thoughts. And for just a moment she did. This image is the final result. Portrait photographers live for the “unguarded moment” like the one Karsh preserved in his Hemingway portrait. But those moments are rare and easy to miss. Karsh hadn’t met Hemingway before he traveled to Cuba to photograph him. He did, however, have the luxury of spending enough time with him to get to know him. That’s rarely the case with today’s portrait sessions. When the photographer doesn’t know the subject or have time to develop rapport, it may be necessary to provoke the moment. Here is an iconic example, again from Karsh. You cannot fail to recognize the subject. Karsh took other photos of Churchill in the same session, but none remotely approach the pure force of personality that radiates from this image. Sometimes you can “provoke” the meaningful moment in a session with less formidable subjects than Winston Churchill. Yanking a stogie out of grandpa’s mouth will probably yield a memorable moment, but maybe not the one you want. A subtler approach may work, but – once again — that technique usually requires some insight into the subject’s character. The next image came out of a session with a young actress, Juliana, a sweet, pretty, and very bright 12-year old I had photographed before. This session involved creating a series of commonplace vignettes for stock photo use. One such vignette included various poses of a young teen reading a book – in this case Grimm’s Fairy Tales. As we took a short break, my daughter, who is my makeup artist and stylist told Juliana to look at “The White Snake,” a story she described as “really weird.” Juliana found the page and began reading. Within moments she was deeply absorbed. Her position, her expression, even her hand positions were perfect. But the lighting and my position were all wrong. I couldn’t change anything without losing that genuine moment, so I shot. I love the end result. It captures her physical beauty, and more importantly, opens a small window through which we can see her in a quiet, thoughtful moment. It isn’t a pose, and she isn’t responding to us. For me, at least, this is a memorable late childhood portrait. But this image’s less-than-ideal beginnings highlights another essential tool of portraiture. That is, the use of imagination and editing skill to draw out what is important, especially when the original image does not yield its treasures easily. You could not have witnessed the scene above as it happened, with your bare eyes. That doesn’t mean it didn’t happen. But it happened with so many detracting other things surrounding it, that you likely would have missed it. Here’s the original, unedited image. The path from this mundane and flawed snapshot to the final portrait wandered through a week of experiments and failures. That process required the imagination to see (more or less) the potential in the original image, the skill and artistic judgement to bring the image to completion, and the determination to do so. Which, to return to the original premise, is why anyone can take a picture, but it takes an artist to create a portrait. Tune in next time when I definitively answer the question, “What is Art?” or maybe give you a great recipe for pico de gallo, which is at least as valuable. Jean Sorabella, Portraiture in Renaissance and Baroque Europe, Metropolitan Museum of Art Website, http://www.metmuseum.org/toah/hd/port/hd_port.htm.